Five different types of puzzles are available. Personalized puzzles make fantastic gifts for all. Turn your life moments into colorful puzzles. We use high-quality materials for our puzzles. Puzzles are all about gathering together. Gathering things is always fun. Especially, if you are putting together the photos that are very dear to you: you plunge into the lovely moments. 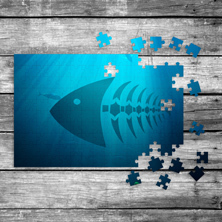 You can have puzzles with custom pictures in various formats. You can as well add text (such as greetings) which makes jigsaw puzzle an excellent gift! A wonderful reminder of your best loved moments from your favourite photographs, you can now create a Personal Jigsaw puzzle of a single or multiple picturtes. Gift your family a surprise jigsaw puzzle of their treasured vacation moments, give your child a jigsaw puzzle of his favorite character, or capture those fun moments of night out with your old college friends. This personalized Jigsaw Puzzle is available in three options of premium cardstock, plastic and wooden jigsaw puzzle.